B O O T L E A D: A new communist continent is being born. A new communist continent is being born. 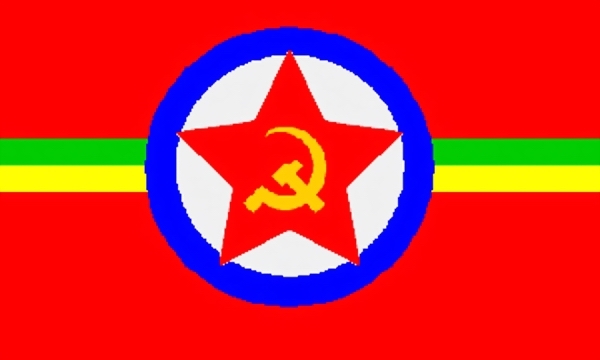 The new Brazilian flag will be this? Click here to view image in original size. WHAT’S OLD AND NEW IN COMMUNISM? - An internal document for members of the Chinese Communist Party regarding its position on religion was leaked to Asia News Service, an important news agency based in Rome. The document was issued in November by the Communist Party’s Department of Propaganda and Asia News reported it in early December. I transcribe it from The Tablet (December 11, 2004, p. 33). This document provides us a clear picture of the internal orientation Communism is following in China. An orientation, one should note, not so different from that of the China of Mao-Tse-Tung, which considered religion “the opium of the people.” The emergence of this document provides a good opportunity to show the naivety of the Western man who believe that Chinese Communism has changed. Unfortunately, based on this supposed change, the West is pouring hundreds of billion of dollars a year into this regime, and also is allowing thousands of Chinese immigrants to enter our countries. The labor force of communist China, increasingly utilized by Western businesses to provide cheaper products (and fill their pockets with money), has a reverse side: we are becoming dependent on this work force. Tomorrow, China can blackmail us by shutting off its labor force. We would face a difficult choice: either we experience a collapse in our industry and commerce or we cave in and do whatever the communist Chinese leaders might demand from us. This “shrewdness” of Western businessmen to turn a quick profit is slowly but steadily making a considerable part of the Western economy dependent on an undependable communist China. In the long run, the maneuver does not appear shrewd at all. More likely, it results from a foolish naiveté, reminding me of that famous communist prediction that the West would give communist countries the rope they would use to hang us. Actually, it is the same old communist plan taking advantage of new allies: Western businessmen. URUGUAY BECOMES ANOTHER COMMUNIST COUNTRY – Understandably, the last U.S. presidential election diverted attention from what happened in the Uruguayan elections, which also took place in November. But now is a good moment to analyze what occurred there. In that small South American country situated between Brazil and Argentine, Communism for the first time effectively came to power. The new president, Tabare Vasquez, is the candidate of the Broad Front, a leftist political group dominated by nothing less than an old terrorist tupamaro movement. Tupamaro was the Uruguayan communist guerrilla movement of the ‘60s and ‘70s that was persecuted by several governments. Finally, it moved above ground, transforming itself into a small political party that is the main political force of the Broad Front today. Soon after the elections, Vasquez declared: “We want to dedicate this triumph to those giants who are no longer with us,” referring to Raul Sendic, the radical communist founder of the tupamaro movement and Liber Seregni, founder of the Broad Front. Thanks to them, Tabare Vasquez continued, “hope won out over fear.” He was repeating a popular slogan exploited in Lula’s victory in Brazil. Different from Lula, however, the new Uruguayan president will govern counting on the majority in Congress. The man who received the most votes in this refurbished Congress was Pepe Mujica, another tupamaro guerrilla who was in jail for 14 years (Adista, November 15, 2004, pp. 10-1). This election adds yet another nation to the extreme-left ensemble of countries in South America that is severely against the U.S. and favorable to Communism – Brazil, Argentina, Venezuela, and Uruguay. BOLIVIA’S SOCIALIST PARTY RECORDS ENORMOUS GROWTH – On December 5, mayors of 327 cities were elected in municipal elections of Bolivia. The results reveal an enormous growth in importance of the Movement Toward Socialism – MAS. These city elections represent a defeat for the traditional parties and a triumph for the left. According to Green Left Weekly, MAS took around 280 of 327 cities, even though it did not win in any of the 10 main cities. Yet in those cities, the situation is not secure. Consider that it came second — with around 20% of the vote — in both the capital La Paz, and in El Alto, whose population was decisive in ousting the president during the October 2003 uprising. In Potosi, capital of a southern state rich in silver mines, MAS did not win, but the elected mayor is from a party inspired by the thinking of Ché Guevara, the famous guerrilla leader who was second to Fidel Castro in the Cuban revolution. In October 2003, Bolivia was the theater for a populist-leftist insurrection against President Sanchez Lozada, allegedly for his policy of selling Bolivian gas to the United States. The violent riots that shook the whole country obliged Lozada to renounce the presidency and flee Bolivia. He was replaced by vice-president Diego Mesa, sympathetic with the rioters. The principal leader of the insurrection was Evo Morales, a key figure of MAS. Morales, by the way, was defeated by Sanchez in the 2002 elections by a narrow margin of the vote (22.5% to 20%). MAS is composed primarily of cocaleros (the native coca growers), mine workers, and peasants. It is supposed to represent the 69 indigenous peoples who make up 80% of Bolivia’s 9.3 million population. In the 1999 municipal elections, MAS took only 3% of the vote. Three years later, in the 2002 presidential elections, the MAS candidate Morales had 20% of the vote. The BBC estimates that in the 2004 elections, MAS got 25% of the ballots cast; Green Left estimates the number at 30%. It is a considerable percentage in a vote divided among 17 political parties with 28% of voters abstaining. The rapid rise of MAS, an implacable foe of the United States, represents a rejection of neo-liberal policies and a general defeat for the establishment parties of Bolivia. The political situation born from these elections projects a future 2007 presidential race between Evo Morales, who would bring under his banner all the leftist forces, and the neo-liberal candidate Jorge Quiroga. Should nothing change on the panorama, the country could well experience what happened in Brazil, i.e, put a Communist worker in the presidency. Before the recent elections, Morales made this prediction at the final MAS rally: “The time is approaching when we Bolivians will be able to govern ourselves, without programs imposed by the IMF [International Monetary Fund] and without corruption.” Morales emphasized “his solidarity with Cuba and Venezuela and with the anti-neo-liberal movements that have risen up in Brazil and other Latin American nations” (Green Left Weekly, December 15, 2004; BBC News, December 6; Inter Press Service, December 6; Prensa Latina, November 30 and December 6, 2004 – all online editions). This is the future South America map. who say that Communism is dead. It is difficult to understand why the West remains oblivious to this new Communist invasion of South America. It seems that those in the United States who want to defend the remains of Christendom against Communism should be wasting no time in asking what to do in face of the rapid transformation of South America into a red continent. Published in the site Tradition in Action.